Wow! What a neat opportunity that has been presented to me. I was fortunate enough to be chosen as part of Modern Mom and Oral-B blog tour for the NEW Oral-B Professional Precision 5000 toothbrush! You may ask, “What does that mean?” Well, it means I was given an Oral-B Professional Precision 5000 toothbrush to review!!! I was super excited. I had been using an Oral-B manual toothbrush. I liked it. Seemed to work well. But for the past three years my dentist has been urging me to buy an electric toothbrush. At first his request were subtle and seemed like suggestions. But this last time I went in he pretty much told me I needed to and showed me the line he carried in his office. And would not you know it, they carried ONLY Oral-B electric toothbrushes. I really wanted to get one but the cost is what caused me to hesitate. And I’m glad I did! Because I got to review this one! So before I got all fancy with this electric toothbrush I was using a manual toothbrush. I brushed once in the morning and once in the evening. I really had no clue how long I brushed. I just kept brushing until my teeth “felt” clean. And sometimes I would get a little carried away and make my gums bleed. I was not dissatisfied or satisfied with my current routine. It was just all I knew and I had not taken time to look into better alternatives. The first thing I notice on the Oral-B Professional Precision 5000 toothbrush was the large time display. It’s HUGE! It’s extremely easy to see early in the morning when you are just waking up or late at night when you are exhausted. The toothbrush actually communicates with the clock while you are brushing! And every 30 seconds it lets you know it’s time to switch to a new area. I think this makes my brushing more consistent and it only takes two minutes to complete my teeth! I can brush longer if I want or feel I need it but it really makes me be more consistent with my mouth routine. I seem to neglect the right side of my mouth and having a timer helps me spend the needed time brushing the right side. I know that sometimes I get a little over zealous and apply too much pressure which causes my gums to bleed but with the Oral-B Professional Precision 5000 it has a pressure indicator and if you are applying too much pressure it lets you know. I also like that it has a compact head. I have a small mouth so I always have to use a small toothbrush. The fact that the head is so compact would make it work for any size mouth. And because the head is compact it surrounds each tooth while it’s oscillating and really gets a deep down clean. Another thing I LOVE about this toothbrush is that it keeps track of when you need to replace the head of the brush. That’s great for me. I always forget to change my toothbrush. Unless I see obvious wear or go to the dentist I forget to switch to a new brush. But this handy dandy indicator will really help out. My overall opinion is that I LOVE this toothbrush! I really wish I would have taken my dentist’s suggestions years ago and switch to an electric toothbrush. The Oral-B Professional Precision 500 is great! It does not take up much space, holds a charge well, and REALLY works. If you are thinking about it or in the market for an electric toothbrush I highly recommend the Oral-B Professional Precision 5000. Check out their website for more information. 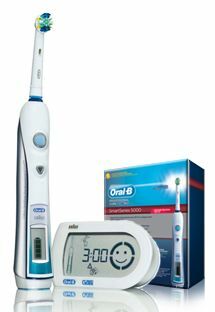 http://www.oralb.com Also, from now until December 31, Oral-B is offering a $20 mail-in rebate on select power toothbrushes November 18 through December 31, 2012. Please visit OralB.com for more information. Disclosure: I wrote this review while participating in a blog tour by Modern Mom on behalf of Oral-B and received a product sample to facilitate my review. However, all opinions are my own and are not influenced by Modern Mom or Oral-B.